Dietspotlight Burn is a daily nutritional supplement that is specifically formulated to help users lose weight. They use a unique blend of recently synthesized ingredients that they claim can help users burn fat cells more rapidly and boost overall metabolism. This review examines these claims to see just how effective a product Dietspotlight Burn can be for our users. Click here to learn more about the differences between the top brands of weight loss aids. Dietspotlight Burn’s promotional materials highlight their product’s ability to increase the body’s natural abilities to convert fat into energy, as well as inhibiting the production of new fat cells. The results that they promise include a reduction in weight, waist size, and overall body fat, as well as increases in energy, mood, and possibly mental performance as well. Other than the common additives caffeine and green tea extracts, Dietspotlight Burn’s proprietary blend is composed of two brand new ingredients that have only recently been formulated. These new synthetic additives are all based on previously successful herbal extracts, such as garcinia mangostana, east globe Indian thistle, and chromium, however they should not be considered natural ingredients. Dietspotlight Burn’s lead ingredient is called Meratrim, which they say helps make it harder for fat cells to multiply while also decreasing the uptake of fat cells from the bloodstream. There are no published human studies that have been performed on Meratrim at this time, so there is no reliable data to show exactly how effective Meratrim can be. The promotional materials for Dietspotlight Burn show highlights from an episode of Dr. Oz that claimed to show women taking Meratrim lost on average 3 pounds over 30 days. There is no clinical data about how this study was conducted, however, and it should not be considered to be scientifically accurate. There is also little reliable data for ChromeMate, a chromium and niacin mineral complex that Dietspotlight Burn claims can help support blood sugar and cholesterol functions. There are no long-term studies that demonstrate the safety of daily usage of either ChromeMate or Meratrim, which is concerning to our team of experts. The other ingredients in Dietspotlight Burn are caffeine anhydrous and green tea extract, which may also contain some degree of caffeine. Green tea has been shown to have some positive effects for metabolism and is recommended highly by our team of experts, however there are some significant issues with using caffeine as part of a weight loss blend. Caffeine is useful for providing short bursts of energy that increase metabolism for a time, however it can lead to crashes that slow metabolism as well. Caffeine is not recommended for use in daily supplements, as there are some potential side effect issues, plus the body can easily build up a tolerance to it, decreasing its usefulness over time. Click here to see our team of experts’ top ten list of the most effective weight loss products on the market today. In addition to these issues with their ingredients blend, there is also an issue with their billing process that has been raised by several previous customers who felt like they were tricked by Dietspotlight Burn into signing up for their subscription program. Dietspotlight Burn’s website offers what they call a free trial, however it actually enrolls users in a program that charges them $89.95 per month. 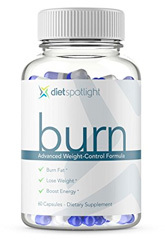 It appears that Dietspotlight has marketed the formula for Dietspotlight Burn under several different names, including Dietspotlight Slim and Dietspotlight Lean. Both of those products have been discontinued, despite the fact that they utilized the exact same proprietary blend of ingredients. It is impossible to say for sure why this is, however it may be due to the high number of negative reviews that started to appear, both for the products and for the billing practices for Slim and Lean. This is an unfortunately common practice for less successful supplements companies that are trying to avoid changing their product or their marketing strategies. Follow this link to find out how to choose the weight loss supplement that is going to be the most effective for helping you reach your goals. Dietspotlight Burn uses green tea extracts, which are one of the more beneficial ingredients for health and wellness supplements in general, and they also have some specific uses for metabolism and weight loss specifically. Caffeine is not an effective drug for use in weight loss supplements, and our experts also have concerns about ChromeMate and Meratrim given their lack of clinical validation. It is possible that Dietspotlight Burn can be moderately effective for weight loss purposes, however this is not guaranteed given how little data there is about the actual biological impact of their lead ingredients. Green tea and caffeine have both shown some effectiveness for boosting metabolism, so it is possible that their claims about accelerating their rates of fat burning are accurate. If so, however, it is not likely to be a particularly significant overall boost. Click on this link to gain access to our team of experts’ complete archive of weight loss supplement reviews. While there is a chance that Dietspotlight Burn may be an effective weight loss supplement, there is not nearly enough data that our review team would feel comfortable recommending it at this juncture. There needs to be more independent research performed into the effects of ChromeMate and Meratrim, ideally including a long-term safety study as well. Our panel of experts also do not tend to recommend any weight loss products that rely on caffeine for their effectiveness. Caffeine should be used only on occasion and specifically for fighting fatigue as there are too many potential side effects and unpleasant consequences to regular caffeine consumption for it to be useful for daily health products. There are far more options for weight loss supplements available to consumers that have more established histories of success and that do not use caffeine in their ingredients blend. As such, our team cannot recommend Dietspotlight Burn to our users. To see the list of the top ten weight loss aid products that our team of experts does recommend, just click on this link.